﻿ JXADF|OSGI|JXTECH|Power Plant Production Management System|Guangzhou Jianxin Technology Co.,Ltd. With many mature plug-ins and components provided in JXADF, users can search for the plug-ins they need in the plug-in store. The perfectly satisfactory plug-ins can be used directly; while for the plug-ins partially consistent with the demands, they can be modified according to the existing plug-in prototype. A plug-in will be customized only if no one plug matches with the demand. Moreover, the customized development can just focus on the requirement of a single application, which means the efficiency of development will be greatly improved. 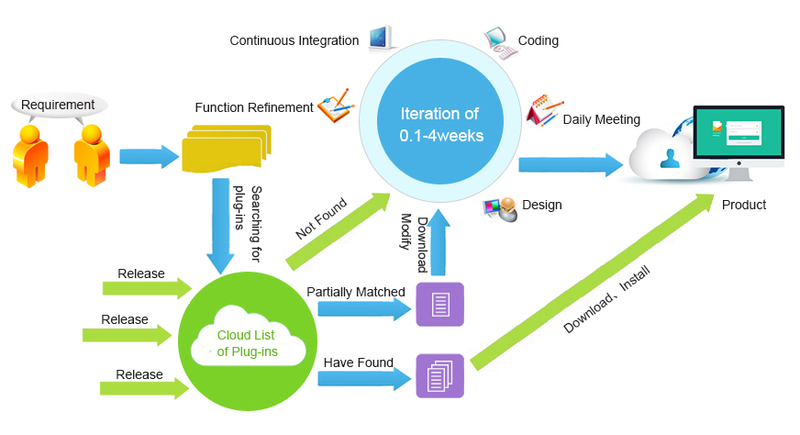 Based on years of experience in concrete projects, the iteration cycle will be narrowed down to 2 hours to 2 weeks when plug-in development model is applied. Plug-in development model can make it easier for the third-party developers to join in the development team. The third-parties provide business plug-ins of all walks of life, while JianXin provides basic platform and advantageous business applications,both of which form a good new-product ecological environment. The mainstream development platforms in the market basically provide some development framework and some basic applications. All the business solutions need to be developed by the developers, who are weak in the second development of packaged softwares. JianXin Tech. solves the problem with their years of experience in platform and business solutions by successfully blending platform and business solutions with plug-ins in a perfect way. The platform can make the following profits for the third–party developers. TIP: The demo data will be cleared on a irregular basis. The system is being improved continuously. There will be updating every week. We have great talents gathering around. We provide competitive salary. We are expecting you here and now! If you plan to be the legendary master of JAVA Architect, WE WANT YOU! If you are a talent with lofty ideals, excellent technology, noble pursuit and strong passion, please let me(wmzsoft@gmail.com)know you.